Dogways.info dog advice by a behaviourist. Hi, my name is Paul and welcome to my site. I am 52 years old, a qualified and experienced canine behaviourist, a regular volunteer to the dog section of a large animal rescue centre and an owner and lover of dogs for most of my adult life (or did they own me ?). I have put this site together to give potential/new and existing dog owners some relevant, up to date knowledgeable advice. If you read through this site you will become a more informed, better dog owner, or a more prepared prospective dog owner. The aim of this site is education leading to a happier life for you and your dogs. The site contains advice on how to do things right, including which breed, breed specific traits and behaviours, where to get your puppy or dog from, when and how to pick the right puppy or dog for you, housetraining tips and advice, socialisation advice, in fact every thing you and your new best friend need to know to have the best possible start together.Without a doubt if you get it right from day one you WILL end up with a well socialised, happy, content and friendly four legged friend for life and believe me there is much to be gained from such a relationship for all concerned. Throughout this site I have tried to make it easy for all to understand, there are no big words or behavioural terms that some might not comprehend, it is not a scientific piece of work though some of it is based on such. 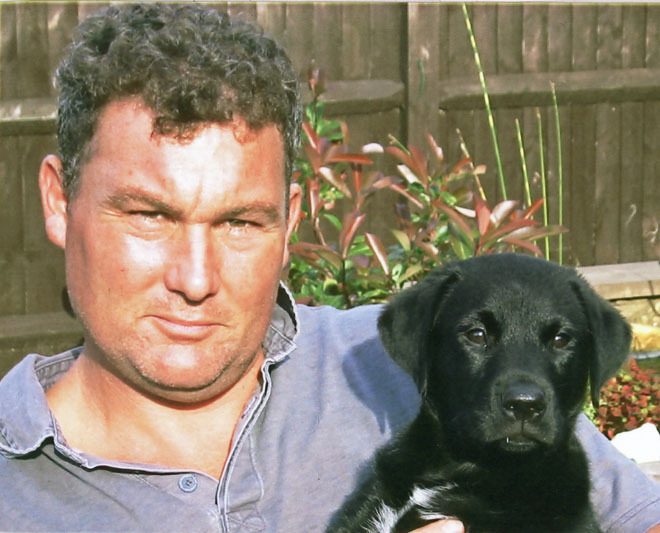 This site is centered on my personal learning and experiences and my own life as an owner of three great dogs, Max, Leo and the latest Buster, a Labrador/ridgeback cross who grew to a six stone version of the little fella in the above photo; sadly I lost him recently, I miss him greatly. My formal canine behaviour training was carried out at the canine studies college at The Doghut.Biz. They were part time residential courses spread over two years with me gaining a level three certificate in Advanced canine behaviour 2008-2009. These qualifications are NOCN (Open college network) accredited courses, recognized top UK accreditors and I attend regular seminars in canine subjects to keep up to date. You can see copies of my formal certificates in the qualifications section. I would like to add here that all the information on this site is advice by me coming from my own personal learning and experience with and about dogs and it is up to you if you wish to use it but I would hope that you would as I truly would like to see more happy dogs and owners out there. There is a lot of content on this site, but is well worth you reading it. All of the text on this site has been created, produced and written down by myself, Paul lindley, and as such is owned by me and protected under copyright law. COPYRIGHT 2013-18, Paul Lindley.